“Eye’s Got It!” is an annual visual art competition created by Jamie Salvador Castillo that brings together a professional panel of judges and artists from all over Central Texas. Artist’s submissions are whittled down through three rounds of increasingly tougher critique and discussions. 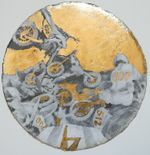 The grand prize is a solo show at grayDUCK gallery. 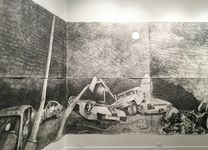 We are excited to present this year’s winner, Austin artist, Rachel Wolfson Smith who won over the judges with her series of large scale graphite drawings, which bring medieval battles and fables into the modern age. Warning myths are about personal transformation. 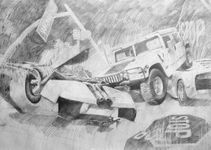 Using them as a guidepost, I create mural-scaled graphite drawings of crashing cars and racing motorcycles to modernize their lessons. King Midas was a poster child for a hard learned lesson. As the story goes, he received a wish for being gracious to a drunk man, and he greedily chose to make everything he touched turn into gold. When his food and daughter were transformed he quickly grew to hate the gift he coveted. It made him humble again. 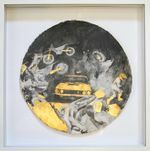 I interpret the allure and consequences of Midas's wish as drawings of race scenes reminiscent of Renaissance battle paintings, and gold-leafed stars, like gilded icons, hovering in the night sky above expensive cars that lost control. Drawn with delicate precision and aggressive pencil and eraser marks, the larger than life drawings dwarf their viewers when experienced. One leads into the next, a small piece pulls you in close, and as you turn away your entire line of vision is consumed by a drawing the size of a room. From afar they look realistic, but as you get closer the pencil marks become a lattice of abstraction. The combination of subjects and physical nature of the drawings imply that there’s something bigger at play. The tension between the thrill and fear of driving reminds me of choices we make in life that pull us in different directions. We’re often guided by desire, but consequence is our mentor. 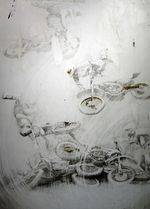 This conflict appears in the drawings as disorienting races and undiscovered crashes, and we’re held there for a moment to meditate on it. Crashes are familiar. We know them from films and the news. I often think “it could be me in there.” Myths warn us so we don’t have to learn the hard way, and give us a way to understand life’s strange mysteries when things happen anyway. As such, my drawings illustrate our modern mythology.